Get ready, intrepid blog readers, for I’m going to tell you a story about one of the best days of my authoring life thus far. On Sunday, I made my way up to Little Shop of Stories in Decatur to see Maureen Johnson and Stephanie Perkins on their tour stop. Because when two of your favorite authors show up at your favorite place in the world, you get in your car and you go. I met my bookish besties and settled in for what I knew would be a fun and hilarious hour. Stephanie and Maureen were hysterical as always, telling stories about smelly hotel rooms, dead bodies, and interpretive performances of Stephanie’s high school journals. When we got to the Q&A portion, I had to ask Maureen for an update on her crazy neighbor (seriously, if you don’t know what I’m talking about, click the link). And when I raised my hand, Stephanie asked me to stand and then told everyone who I was, and that I had written a book called Meant to Be. I managed to keep my brain from exploding and oozing out my eyeballs, said hi to the crowd, thanked Stephanie for being so stinkin’ awesome, and then asked Maureen about her neighbor (which illicited an hysterical response about a threshing machine). That moment right there? That would have been worth ten drives to Decatur, but that’s not even the best part. 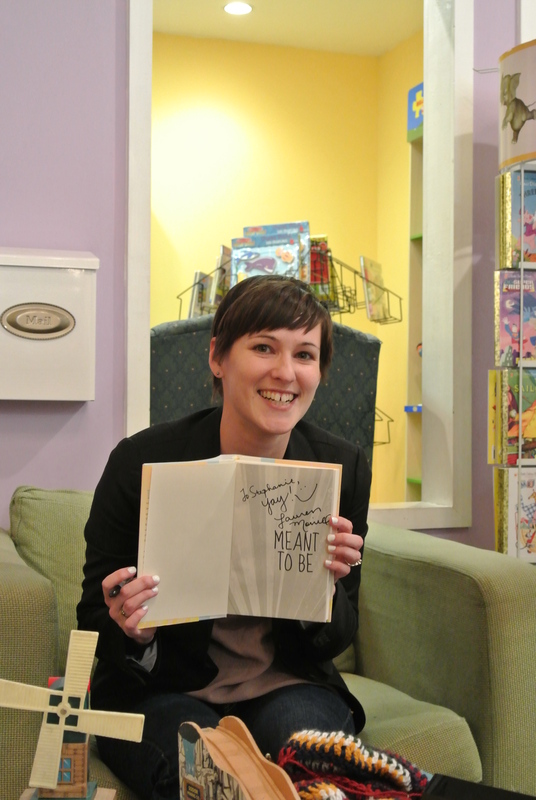 For you see, after the event, Stephanie bought a copy of Meant to Be from Little Shop and had me sign it for her. I say this all the time … in fact, I said it in my last post when I talked about meeting Robin Benway, but I have to say it again. The YA Community is absolutely the coolest, most fun, most supportive group on the planet, and I thank my lucky stars daily that my passion brings me in contact with all these amazing people. And when I say YA Community, I don’t just mean authors. I’m including agents and editors and designers and bloggers and readers and tweeters and fangirls and fanboys and everyone in between. Also, that thing in my lap in those pictures? Well, as if I don’t need another thing to take up lots of my time (you know, what with the writing and the reading and the internet-ing …), I taught myself to crochet last weekend. I’m working on a blanket, and I managed to add three rows while at Little Shop. And yes, I’ll always think of this awesome moment when I look at that blanket forever and ever.